In 2015, WFME published an updated second edition of the WFME Global Standards for Quality Improvement: Basic Medical Education. These are a global medical education expert consensus on the best practice minimum requirements (basic standards) and standards for quality improvement. The standards comprise altogether 106 basic standards, 90 quality development standards and 127 annotations. The standards are organised into nine universal themes: mission and outcomes; educational programme; assessment of students; students; academic staff/faculty; educational resources; programme evaluation; governance and administration; and continuous renewal. 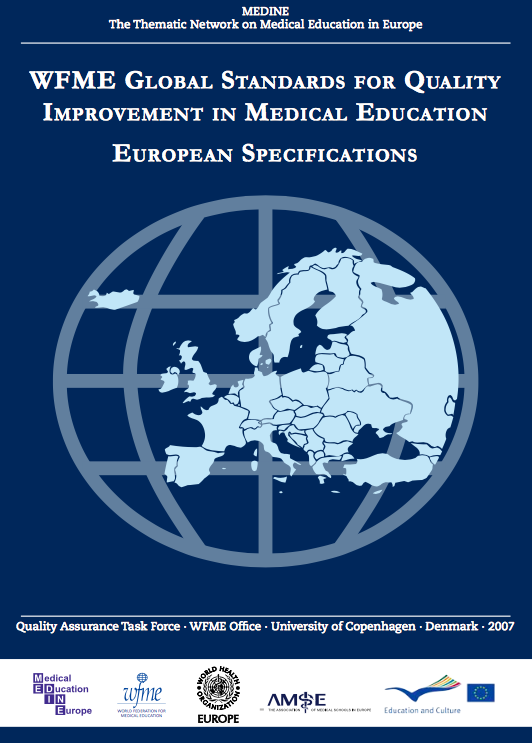 European specifications of the 2003 edition of the BME standards were developed by a Taskforce set up by the Thematic Network on Medical Education in Europe (MEDINE), chaired jointly by WFME and Association of Medical Schools in Europe (AMSE) and sponsored by the Commission of the European Union and the WHO Regional Office for Europe. The enhancements in the European Specifications were subsumed into the 2015 edition of the BME standards.